The project of Montreal-based violinist Emilie Livernois-Desroches and experimental guitarist Eric Quach, Mains De Givre is the first signing of the label set up by Canadian magazine Textura. Both already respected musicians in their own right, Quach for his ambient work as thisquietarmy and with instrumental rock band Destroyalldreamers amongst others, classically trained violinist Livernois-Desroches for projects spanning a wide range of genres, from metal to folk, the pair met over seven years ago while playing in two different bands, but only began working together a year ago. The result, Esther Marie, is a stunning collection of deeply atmospheric and dark experimental compositions. Built from early jam sessions, and assembled into four striking pieces, each with its individual tone, Esther Marie progresses especially slowly, as guitar and violin layers, processed into exquisite textures, become entangled and appear weighed down by their own gravity. There is a natural flow running through the whole album, especially as there is no clear demarcation between the first two tracks, as the vast clouds of distortions generated by Quach freely stretch from Un Chœur D’Ames En Detresse into Le Cercle Des Mœurs, and while the last two tracks are more distinct, they are carved from similarly dense soundscapes, as to permanently enforce the quietly abrasive and sombre nature of the record. Indeed, nothing is quite as gentle or peaceful as the first impression could lead to think. The pair’s chosen name, Mains De Givre, which translates as frost hands, signals a somewhat glacial approach, reinforced by the often gothic track titles – Un Chœur D’Ames En Detresse (A Choir of Distressed Souls), Le Cercle Des Mœurs (The Circle Of Morals), Cauchemar Noir Et Rouge (Red and Black Nightmare) or Larmes Sanglantes (Bloody Tears). Equally, the intensity and intricacy of Quach’s soundscapes are totally compelling, his heavily processed layers of distortions, manipulated further to ebb and flow over the course of a piece, proving particularly gritty and abrasive throughout. This is tempered slightly by the haunting sound of the violin, but these ethereal brushes also contribute to giving this record its unreservedly sombre quality. Un Chœur D’Ames En Detresse opens with a few toll-like scattered guitar notes upon which the violin rapidly comes to cast a timid melody. As the track progresses, the backdrop fills up with increasingly harsher stabs of guitar until the sound becomes hazier, and continues to do so through the three remaining pieces, gaining particular density in the second half of Cauchemar Noir Et Rouge, and again toward the end of Larmes Sanglantes, as the violin appears to struggle to extricate itself from the sonic mass. 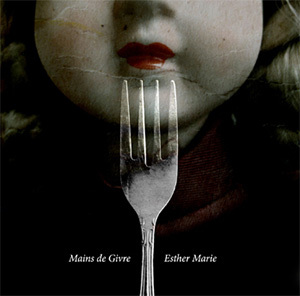 Mains De Givre work from a relatively sparse set of sounds, but the extremely refined and sophisticated layering that characterises the four tracks here gives Esther Marie an incredible weight and contributes greatly to cast its deeply atmospheric mood. With this, Emilie Livernois-Desroches and Eric Quach have created a truly magnificent record, which should be missed under no pretext. Esther Marie is available now from the Textura website. Limited to 500 copies.